Are you looking for a software, that can be an appropriate one for both creating your charts and your maps? What about a software, which you can use as a smart and useful tool for drawing charts and maps as well as flowcharts, diagrams, schemes, plans and other simply great looking models? Do you think it’s hard to find such a complex application? Nowadays, there’s such application, known to be a ConceptDraw DIAGRAM software. Having ConceptDraw DIAGRAM means having a huge range of many different tools, such as design symbols and pre-made examples, which all can be found in so called “solutions”, full of the samples, templates and design elements. If your work requires creating the flowcharts, which are basically the types of diagrams, representing some particular algorithm, process or workflow, showing the steps in a way of the boxes of various shapes connected with the numerous arrows, then the previously mention software — ConceptDraw DIAGRAM — can be the only one useful for such purposes. Thus, you can always create the Process Flow Diagram showing the arrows illustrating the flow of material as well as symbols, such as valves, tanks and other equipment, which are all available for your use in the libraries from the solutions. The kinds of business activity, where the flowcharts may be needed to be created, can include such processes, as analysing, designing, documenting, managing, representing, showing the steps, representing the solutions to a given problem diagrammatically or in another visual form, representing the process operations, visualizing any other processes in order to help to understand them. 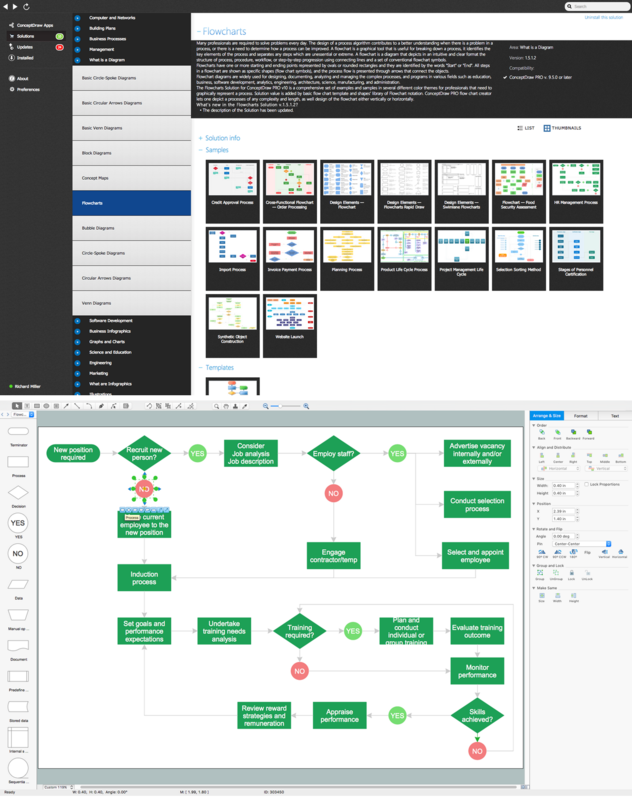 ConceptDraw DIAGRAM is as well as Windows, also a Mac OS Flowchart software. To start to create your own charts, flowcharts or diagrams with ConceptDraw DIAGRAM drawing application is very simple and having it you will and accomplish great results within a very short period of time, using the pre-made examples as your drafts. If you are looking for the best professional Mac OS flowchart software that gives its users the ability to simply draw any type of flowchart, charts, diagram, map, scheme or plan, then now you know which one to download as ConceptDraw DIAGRAM application is known to be one of the best drawing tools for fast visualizing any structural data using the vector stencils from the stencil libraries with the use of the so called “RapidDraw technology”, being a great alternative to MS Visio for Mac. There are many different flowcharts, such as cross functional ones, you can create in ConceptDraw DIAGRAM The mentioned cross functional flowcharts are used to describe a process where different people are involved in, as well as at least a few departments or other functional areas. As it’s known that it can be sometimes difficult to keep track of who is responsible for each step of the business processes and so who is in charge for the final result. To divide such flowchart into columns can be useful for analysing the number of times this process was “handed over” to different people. Process flow diagram can be used for presenting the relationships with components in the drawings, when cross-functional flowcharts are usually being used for showing the relationship between a business process as well as the functional units (e.g., departments) responsible for that process. To be able to make such flowchart, it is always better to use ConceptDraw DIAGRAM Cross Functional Flowchart software that allows to visualize as well as to communicate the operations of some business process flow step by step, mentioning all responsible departments or people in particular for each operation. Cross-functional flowcharts can be created horizontally and vertically. In a vertical layout, the bands represent the functional units run vertically (from the top to the bottom of the page), highlighting all the functional units. In a horizontal layout, the bands represent all functional units running horizontally across the drawing page, highlighting the process itself. Any cross functional diagram, displaying the workflow as well as the functional positions, helps to mention who exactly is involved with each of the steps in the workflow. Any type of such cross-functional flowchart can be made for only a few minutes using ConceptDraw DIAGRAM diagramming software as well as “top-down flowcharts”, “block diagrams” (also known as a “decision tree” or “logic diagram”), “flow process chart”, “work flow diagrams”, “process maps”, “state change charts”, and other. Thus, you can always make any of the mentioned above charts, as well as many other flowcharts, with help of ConceptDraw DIAGRAM and ConceptDraw STORE application, full of the so called “solutions”, containing the stencil libraries and the pre-made examples of any needed drawings. The flow chart example "HR management process" was created using the ConceptDraw DIAGRAM diagramming and vector drawing software extended with the Flowcharts solution from the area "Diagrams" of ConceptDraw STORE also using green flowchart making technique of Rapid Draw technology. If you wonder why to be bothered creating charts if you can simply insert any needed text into your presentation, then it’s important to remember that visual representation of the same data is always easier to understand and that having charts in your business documents can simplify their understanding the large quantities of data and so the relationships between different parts of this data. Thus, charts can usually be read and so understood more quickly than the raw data, that’s why they are used in a wide variety of business activity. You can create your charts, flowchart, maps, diagrams as well as schemes by hand, but really, why to be bothered if there’s a very convenient software providing you the necessary tools for making the same thing, but within only a few hours or even minutes, depending on how familiar you are with ConceptDraw DIAGRAM flowchart, diagram and chart software.